When choosing a name for your baby the Internet provides you with a massive amount of support and encouragement. What to call your baby and more importantly, what NOT to call your baby. There are even lists upon lists of name definitions and even name origins. Now before I continue I’m just going to stop my parents freaking out, ( as much fun as it is ) and state that sadly I am not pregnant, up the duff or have any type of bun in the oven ! I am in fact trying to decide on a name for my first ever website, exciting! It may only be a small step but a step that I’m getting more and more excited about by the day! My lovely mother has taken on the role of website designer as all this code business makes my head hurt. There is only two main things left to do. One find a graphic designer, ( eeek proving more difficult than I thought , please let me know if you have any talented friends ) , and two picking a name. I’ve crossed and scribbled my list down to three possible names; Number Eight Wire, All in Good Company and The Salt of the Earth. ‘Event design’ will follow the chosen name and be presented in (here’s hoping) a fancy graphic design. Be sure to let me know which one least reminds you of an annoying co-worker or that kid who bullied you at school! 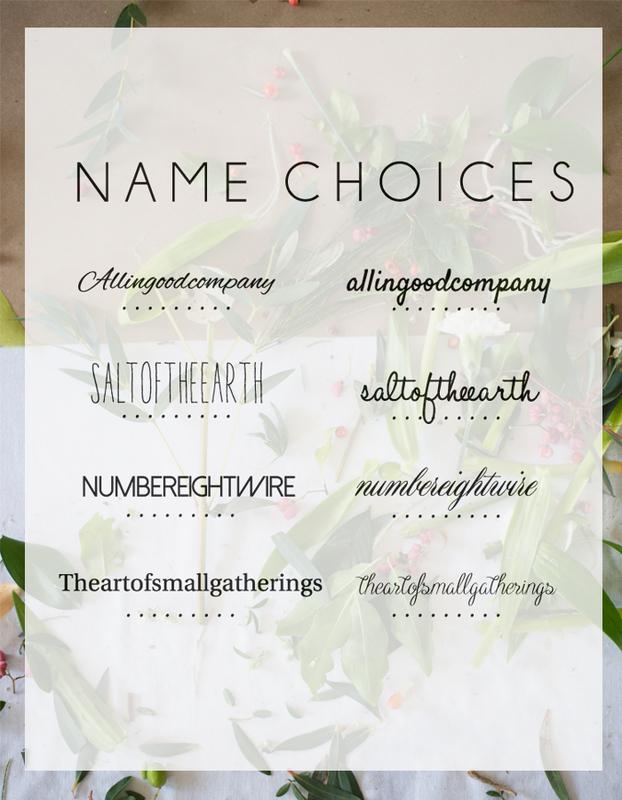 This entry was posted in General Posts and tagged allingoodcompany, aspiringeventdesigner, babynames, Design, event design, event planning, event styling, exciting, graphic design, joannagibbs, Namechoice, numbereightwire, picking a name, theartofsmallgatherings, website. Bookmark the permalink. Ahh I can totally relate to this post! It is a hard decision! I love the name allingood company and I am a random that has stumbled across your page not your granny haha.